Surgery can be big scary word to some people; it is a big deal to “have surgery”. We want you to feel at ease and for your pet to be pain free and back to normal as soon as possible. We will take every precaution we can to ensure a safe and uneventful procedure. We routinely perform “bloodwork”, a CBC and chemistry panel, before anesthesia or surgery. This is a simple blood draw from the pet and takes us about 30 minutes to run the tests in our lab.This allows us to identify potential risk factors such as liver and kidney disease or bleeding disorders and allows us to make any adjustments to our anesthetic and surgery protocols. An IV catheter will also be placed before the procedure to allow us to deliver anesthetic agents, antibiotics, or other medicine that may be needed, while minimizing any stress for your pet. After receiving an induction agent through the catheter, a breathing tube will be placed so that the airway will remain open during the procedure. The pet is maintained on an anesthetic gas called isoflurane throughout the surgical procedure and vital signs are monitored by a veterinary technician while the Veterinarian performs the procedure. The surgeon and staff wear caps, masks, and gowns in the surgery room and use sterilized equipment, the same as if you were to have surgery at a hospital. Your pet will also receive pain medication before and after the procedure, so that they will recover faster, with minimal discomfort, and return to their normal routine at home sooner. We utilize a CO2 laser to perform many of the incisions during the surgical procedure. The laser helps to decrease bleeding, inflammation and seals nerve endings. This helps the incision site to heal quicker and with less pain as well as helps the veterinarian because the bleeding is decreased during the procedure. It is a win/win situation. In our experience, laser surgery allows the patients to heal approximately 20-30% faster than using a conventional scalpel. Most of our surgical procedures do not require an overnight stay. Most pets will be able to go home on the same day as their procedure. Exceptions to this would be things like declaw procedures, intestinal or bladder surgeries, orthopedic surgeries such as fracture repairs, cruciate repairs or correction of patellar luxation. Often times a pet will need special at-home care after the surgical procedure, we will discuss that care with you at dismissal. Please pay close attention to these instructions! Be assured that we will do everything possible to ensure the procedure goes as smoothly as possible and that you are kept up-to-date as things happen on the day of your pet’s surgery. Dental and oral health is a necessary and vital key to keeping your pet healthy. Good oral hygeine will add years to their life and keep them free of oral pain. Plaque and tarter accumulate on the teeth and around the gum line which can contribute to health problems such as bad breath, gingivitis, periodontitis, painful teeth and gums, liver, kidney, and heart disease. Cleaning and polishing of the teeth will remove the plaque, tarter, and calculus from the teeth and should routinely be performed every 1-2 years, although toy and small breed dogs will often need their teeth cleaned more frequently. After a cleaning and polishing, a fluoride treatment will be applied to help strengthen the teeth and reduce sensitivity. Antibiotics are also prescribed for infections around the gum line or for any abscesses that we find. Pain medications are also prescribed if necessary. Our dental x-ray machine can also be used to help diagnose problems not seen on a visual exam of the mouth. Some conditions that can be diagnosed with x-rays are tooth root abscesses, retained or impacted teeth, broken tooth roots, jaw fractures, bone infections and cancer. It is also used to evaluate teeth that need crowns, root canals, or extractions. The use of oral health products at home will help to slow the buildup of tarter and the formation of calculus (mineralized plaque and tarter). These products are commonly recommended after dental procedures to extend the length of time between cleanings and to help keep your pet as healthy as possible. 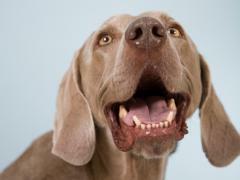 How do you know if your pet needs dental care? Pets don’t say “Hey, I have a toothache”, but they do show signs of dental issues. Having semi- annual Veterinary Exams are the best way to head off major dental concerns. Just like in humans, catching the problem areas early can minimize the treatment as well as the costs. Most dental procedures are outpatient procedures where your pet will stay with us throughout the day and go home with you that night. To perform these correctly, your pet will need to be anesthetized and monitored throughout the procedure the same as for our surgeries. They will be a little sleepy or drowsy that night and may not eat as well as usual but should be back to normal the next morning. For more involved procedures you may need to soften the food or feed a canned diet for a week or so, but their mouths will feel much better after it’s all over. Many times the owner is unaware that there is a problem because the pet is acting normally and still eating and drinking. It is only afterwards when the pet’s appetite increases or energy level goes up that they become aware there was anything bothering their friend.